Description of "Advanced Guide On Disaster Management Natural & Manmade Volume - II (eBook)"
VOLUME II OF ADVANCED GUIDE ON DISASTER MANAGEMENT deals with NATURAL DISASTERS. Most often natural disasters like tsunami and earthquakes have very wide range of destruction because they travel unhindered long distances and can eradicate ecosystems, civilizations causing irreparable loss of environment and precious human lives, damage to build up areas and properties, industries, infrastructure of roads, railways, airports and cities. Losses occurred by natural disasters can never be recovered / constructed fully. Effective mitigation and rehabilitation measures need to be adopted to counter the effects of natural disasters. 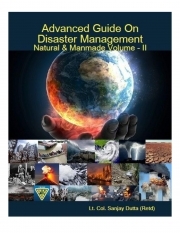 Reviews of "Advanced Guide On Disaster Management Natural & Manmade Volume - II (eBook)"